Tat·too (tă­tōō’) n. pl. tat·toos – A permanent mark or design made on the skin by a process of pricking and ingraining an indelible pigment. Re·gret (rĭ-grĕt’) n. – A feeling of sorrow or remorse for a fault, act or disappointment. It seemed like a great idea then, but seeing your old flame’s name can be a pain now that the relationship is over. Unfortunately, we all make mistakes when in love. An indiscreet tattoo can make or break a job opportunity. Some job-hunters want to have their ink removed whether they’re serving, working retail, or most importantly, pursuing a professional career. Sometimes tattoos just look terrible, and the only possible fix is to remove the eye sore. Indy Laser™ Tattoo Removal, a solution that helps to permanently eliminate the pigment from your skin. The laser gently delivers a quick pulse of energy that instantly fragments the large ink particles into tiny ones that your body can eliminate through its natural processes. Over the next few weeks and months your body’s lymphatic system will absorb and eliminate these miniature specks of pigment just as it does with a tan as it fades. It can take anywhere from 3-23 treatments to eliminate a tattoo. 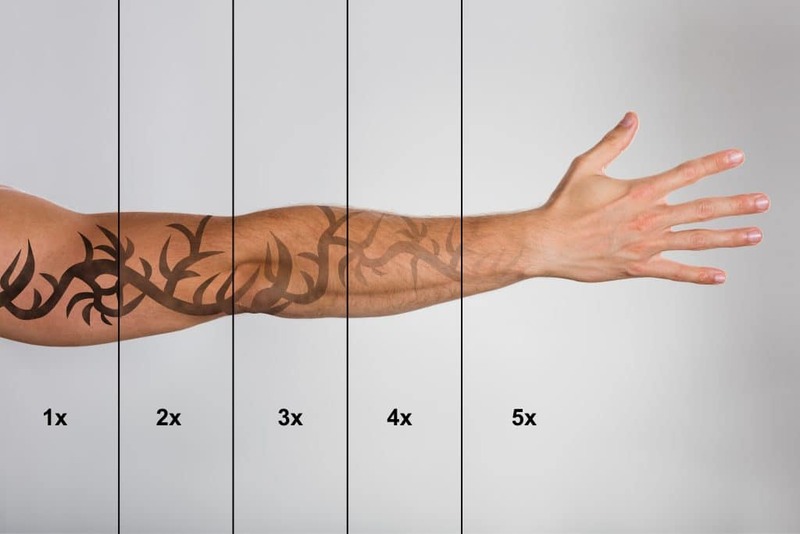 The inks, location, quality of your tattoo, as well as your skin type, will have an impact on how many treatments will be required. Not all lasers are safe for all skin types. The Indy Laser Tattoo Removal process uses multiple lasers and wavelengths that are FDA Approved and have the ability to safely and effectively treat all types of tattoos allowing us to get the best results possible. In Indianapolis there are very few places that have the technology and experience to provide consistent, lasting results. We have more than 6,600 hours of training on lasers and skin, over 100,000 hours of staff experience, over 2,500 days with no staff turnover, and have performed more than 270,000 treatments on customers from all over Indiana. So, when it comes to cosmetic laser centers in Indianapolis and Central Indiana, we are the professionals, and The Official Cosmetic Laser Center of the Indiana Pacemates, Miss Indiana and the 2011-2013 Indianapolis Colts and Colts Cheerleaders.